The STARFIRE state-of-the-art design produces a dynamic advertising message center that is energy efficient, easy to operate, install and service. The STARFIRE LED Sign Series provides you with a flexible sales tool product that is bright and easy to read. The STARFIRE LED Sign Series is designed to offer the market a 4, 6, and 9.6″ LED character as a direct replacement for 4, 6, and 8-inch static characters found in most manually changed letter-boards. 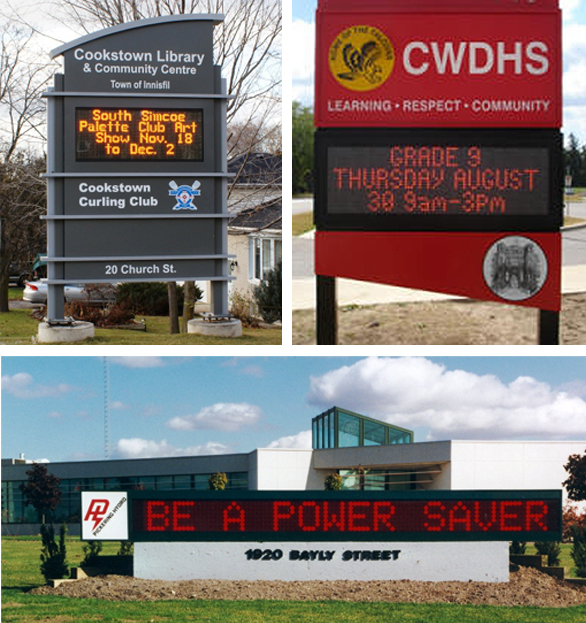 THE STARFIRE LED Sign Series offers the flexibility of 1 to 6 lines of messages, and features a scalable character size of 6 inches to 40 inches. Constructed of lightweight, high-tech, durable extruded aluminum casing, these highly visible, LED signs can be used in a variety of applications including schools, banks, shopping centers, churches and auto dealerships. Industry leading 4.0″ Cabinet Depth! • 16mm, 21mm or 27mm pitch from 1 to 6 lines of scalable text. • Scalable character size of 6 inches to 40 inches. • 256 shades in every model for red or amber. • Front access to all electronic components with hinged LED displays. • Cabinet Depth of 4.0 inch for best profile in the industry. • Polycarbonate face for vandal resistant applications. • Modular LED configurations enables fast delivery and easy installation. • Wired, RF Modems, or DSL /Cable modem.